Food journaling is an important tool for achieving effective and permanent weight loss. Why? Because it works. 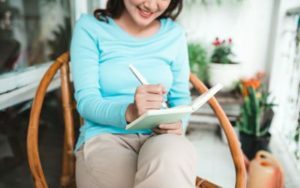 A common component of weight loss programs, multiple studies have shown food journaling to contribute to successful and sustained weight loss. When it comes to food journaling, keep it simple. I recommend clients do food journaling in advance and include what and when they will eat. At night, I always take about 10 minutes to plan my meals for the following day. While food journaling shouldn’t be complex or in-depth, it does need to include the components outlined below. Food journaling provides data to help with future planning and decision making. Like any big project in your life, such as earning a degree, planning a wedding or saving for retirement, you must have data to drive your progress. For example, having a plan to save a down-payment on a new home and keeping track of what you have saved will increase the likelihood of your success. It’s the same with weight loss. Your food journal provides the data to help you plan, evaluate your progress and make the necessary adjustments to achieve your desired results. As you journal, you will find meals that satisfy you and are convenient. You will be naturally drawn to these choices repeatedly, which will make journaling simpler. In the beginning it will take some adjustments but, like any new skill, over time it will become easier. Ideally, you should plan your food in advance. You do not need to record exact amounts like “1/4 cup of peanut butter, 14 almonds, or 1 ounce of cheese.” Just write what you plan to eat, such as “peanut butter with celery, almonds and cheese chunk.” Decide what you will eat about 24-hours in advance. Do not be spontaneous with your food choices; we make bad decisions when eat on the fly. Plan out each meal you will eat. Record your weight each day. While I know this goes against the recommendations of nutritionists all over America, go ahead and weigh yourself each day and record it. You will have daily fluctuations, but the data will help you understand how food choices affect your goal. You will be able to see “when I eat peanut butter, the number on the scale goes up.” Or “when I eat off plan my weight goes up.” Both are useful pieces of information and help you to make decisions going forward. An increase in weight after eating off plan is expected. Seeing an increase in weight after eating peanut butter, may be a surprise and provides feedback you can use for future planning. Don’t give the scale power over your thoughts. I understand that weighing every day can be intimidating. Many of us believe the scale has the power to make our day awful. The anticipation of that little number causes anxiety, irritability or self-loathing over the prior day’s decisions. The reality is, IT’S JUST A PIECE OF PLASTIC ON THE FLOOR. The scale literally DOES nothing. It is an instrument that weighs our gravitational pull towards the earth. Your feelings of anxiety, irritability, self-loathing, are emotions that are the results of your thoughts. In the end, your body mass will be the same regardless of whether you weigh yourself daily. So, weigh yourself daily and use the data to make better, more informed decisions. As part of food journaling, you should record how hungry or satisfied you were with that day’s meals. Ideally, this should be recorded in real time. Record how hungry you were prior to eating and how you felt following your meal. I recommend using the hunger scale, which is a data-driven way of recording how hungry you feel. The hunger scale is briefly explained below. Draw a number line from negative 10 to positive10 with zero at the middle or neutral point. Negative 10 is someone physically starving to death, which typically does not occur in the United States but does still occur in developing countries. Positive 10 is someone who has stuffed themselves so full of food that they are physically ill. Thanksgiving dinner is probably a +7 or +8 in my book. Positive 10 would need medical attention. Zero is neither hungry nor full. It’s perfectly content. The zero zone is when you are unaffected by hunger. Ideally, you start eating at -4 and stop eating at +4. For me, I like to think of +2 as there is food in my tummy but I could still run around the block. When I reach +4, there is food in my tummy and I couldn’t run around the block but I could still walk around the block. Have a plan for the unexpected. Maybe the food you thought you were going to eat went bad. Or, maybe a teenager in your house ate the yummy looking meal you prepared for your lunch. Perhaps the food you heated up fell on the floor because you used a non-microwave-safe bowl. Stuff happens, so what should you do? When things go wrong, we are all tempted to throw in the towel and order a pizza. If you do, however, you will not reach your goals. Always have a back-up plan. My back up plan the corner gas station where I can buy two cheese sticks and two packs of nuts. When “stuff happens” and I’m in a pinch, that is my go-to meal. When you need to adjust your food plan, it offers you a great opportunity to develop personal accountability. Below, find an example of a food journal. The "Plan" is written out in advance the day prior. In the evening, I typically record my "Actual" food consumption and include my pre and post meal food scale rating. I always include the times I ate, hunger scale and any minor adjustments to the plan. A simple approach to food journaling should take about 10 minutes per day. The information you glean from this exercise, however, is invaluable to your weight loss efforts. And, as previously stated, food journaling has been shown in multiple studies to contribute to successful and sustained weight loss. So don’t let 10 minutes of journaling each day stand between you and your weight loss goals. If you are interested in more information on food journaling, contact me to schedule a mini coaching session. Let’s work together!